How to Update theme to the latest version? To update theme from Themeforest you need to install Envato toolkit plugin. After you’ve downloaded the plugin (by clicking the “Download ZIP” click on the right-hand side of the page), there are a few steps to go through to get the plugin up and running. You will need to generate an API key to link your WordPress site to your Themeforest account. Login to Themeforest, go to your dashboard and click on “My Settings.” The API Keys screen allows you to generate a free API key. 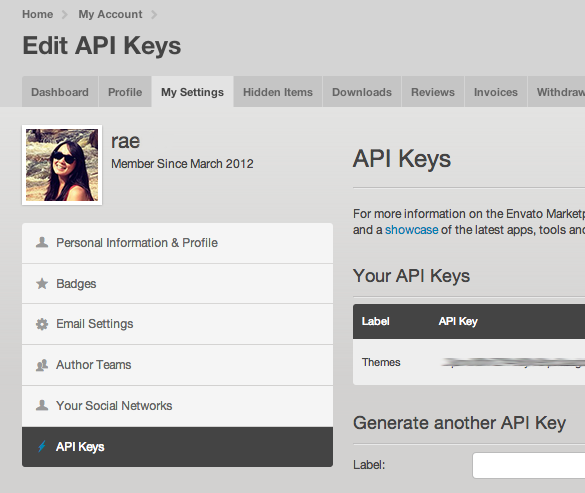 Generate a free API key on the Themeforest website. All of your theme purchases will now appear on this page after it refreshes. The plugin will now alert you to theme updates – so long as you check the toolkit settings regularly. Click on “install automatically” beside each of your themes to automatically update them. The toolkit settings page also allows you to install themes that you haven’t already uploaded to your site, delete ones you don’t use and view version details. You can also set up theme backups. It’s a fairly simple plugin, but also a helpful one. Envato WordPress Toolkit was released in 2012 and hasn’t changed all that much since. It’s yet to have its own auto-updater, so hopefully this is a feature the folks at Envato will add soon.